home » news » finally some news! It has been a long road to another online jewelry release. Over the last two years we have constructed this entirely new website, started a tumblr for work-in-progress chatter and inspirational artifact photos, attended Dollism Plus US, and begun selling some limited pieces on Etsy. I meant to get around to sending a note out about any this, but I foolishly kept waiting for everything to look finished and perfect before typing up a newsletter. So Dollism has come and gone, many of you are already following along on tumblr or buying from Etsy, and the new website is up and running, if a little spare. We’re proud of the successes we’ve had and we’re ready to share some new pieces. I have spent most of my spare time studying astrophysics and planetary science over the last year. I have also been experimenting with etching copper, and the two have combined into a new jewelry concept. These “future talismans” integrate current observational science with ancient protective amulets. The etched and oxidized pendants have the feel of a treasured talisman that has been passed down or rediscovered. 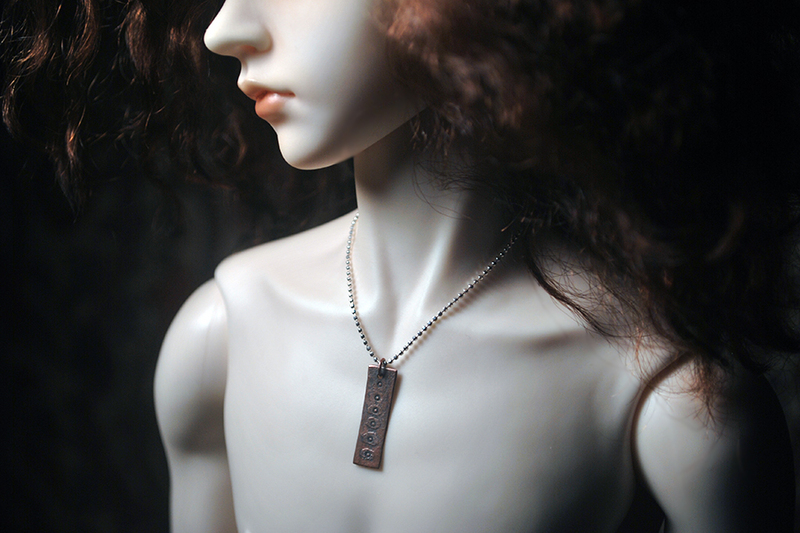 Maybe its meaning is obscured by time, but it’s still precious enough that its owner has put it on a new chain. The other pieces in this release flank this concept, either as cleaner, bright sterling depictions of astronomical bodies or as mythological icons and antique trade beads. Current auctions end on August 16th. We will be donating a percentage of the proceeds from this jewelry auction to the Den of Angels forum fundraiser. Not only is it the place where we’ve made many close friends, we also got our start by selling in the Den of Angels marketplace. We could never have achieved what we have so far without such a supportive environment in which to launch our business, and we will be showing our gratitude by helping to pay for the move to a newer server wand an upgrade to better software. If you find that you will not be bidding on any of our jewelry, please consider making a donation to the BJD forum that has been such a huge positive influence on our mutual hobby.